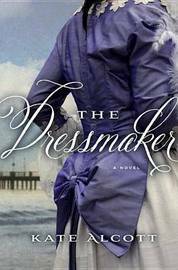 I chose to read to read The Dressmaker because I was interested in reading about the scandal surrounding Lady Lucile Duff Gordon, a well known fashion designer married into the aristocracy, and her behaviour following the sinking of the Titanic. The congressional inquiry into the tragedy and the accounts from crew and passengers was fascinating enough to keep me reading but the central theme is a romance involving fictional characters in which I wasn't particularly interested. Tired of being a servant, Tess Collins, an aspiring seamstress leaves her employment and is lucky enough to be hired by Lady Lucile as her personal maid on the Titanic's doomed voyage. Once on board Tess catches the eye of two men, one a roughly-hewn but kind sailor and the other and enigmatic Chicago millionaire. Not hard to guess who is going to win the heart of the fair maiden! It's all too predictable and I never felt the necessary connection to any member of the 'love triangle' to really care what happened to them. Light, pleasant reading that will appeal to readers who enjoy historical romances and anyone interested in the story of the Titanic and its aftermath. I found this fairly underwhelming. I picked this up, but haven't heard many really good things about it. Oh I've read several good reviews. It's on my TBR list. misfit - underwhelming! Perfect description. Marg - I wouldn't rush to read it. Mary - I think it depends on what sort of story you like. I'm not a fan of romances so it wasn't really my thing. Sounds bland. The Titanic setting is interesting, but I think I'll pass.